Das bewährte Kauderwelsch-Prinzip mit Wort-für-Wort-Übersetzung eignet sich auch hervorragend zur Vermittlung der deutschen Sprache. Dieses Buch wendet sich an alle, die die englische Sprache beherrschen, und die schnell und unkompliziert Deutsch lernen möchten. 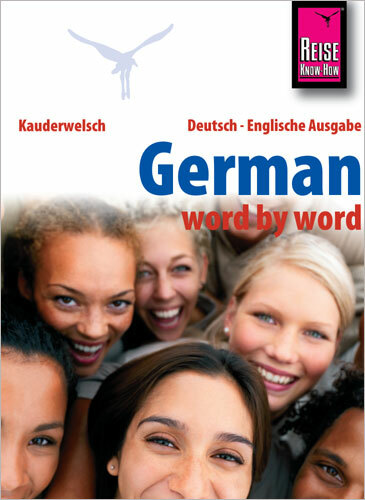 Kauderwelsch „German – word by word“ is a language guide book that helps you take your first steps in German quickly. Kauderwelsch books are more than your standard phrase book but not full-fledged text books either. They aim to teach you just enough to get along, so you can start using German in everyday life. The books can also serve as a head start for those who want to learn German more thoroughly later. At the core of the book is a word-by-word-translation: each sentence is translated both literally as well as into proper English. This helps to understand how the German sentence is built up and get a feeling for the language. As you dive into the oddities of the German language you will also find out about contemporary life, food, accommodation and many other things which travelers will encounter in Germany. Also available: Audio material for „German – word by word: Pronunciation trainer“ (Audio-CD or mp3-download). Free samples from the pronunciation trainer can be accessed from the book by QR- code.